Hair Care: NIOXIN, Simply Smooth, Deva Curl. Hair - Color Correction,Precision Cut, Deva Curls Inspired Cutting, Up DO's, Design Custom Color, High-lite, Low-lite, Design Perm Wrap, Simply Smooth Keratin Treatment Straightening, Specialty Scalp Treatments. 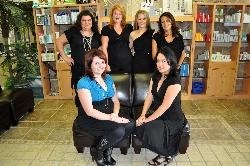 Shellac With Basic Manicures or Spa Manicures, Spa Pedicures & Spa Manicures. Classic European Facials, Acupressure Points, Aromatherapy, Ultra-calming, Acne, Micro-Zone Treatments, Multivitamin Power Firm, Skin Brightening. Arms and Hands, Decollete, Legs and Arms, Back Purification, Body Thermal Stamp. My Name is JoEnn. I Specialize in Precision and Deve Curls Inspired Cutting, Color Specialist and Color Correction, Simply Smooth Keratain Treatment, Waxing, Body Treatments, Facials, and Natural Nails. My Name is Allisha, I Specialize in Precision hair Cutting, Color Specialist, Color Specialist and Color Correction, Waxing,Make-Up Artist, Up-DOs for all special occasions. My Name is Cindy, I specialize in precision hair cutting, Color Correction and Color Specialist, Waxing, Make-Up Artist, And Up-Dos for all special occasions. My name is Katie, I specialize in precision hair cutting, Color Specialist, Waxing, Up-Dos for all special occasions and Natural Nails. My Name Is Mary, I specialize in precision hair cutting, Color Specialist, Waxing, And Up-Dos for all special occasions. My Name is Monica, I specialize in precision hair cutting, Deve Curl Inspired Cutting,Color Specialist, Simply Smooth Keratin Treatment, Waxing, Up-Dos for all special occasions and Natural Nails. My Name is Phu, I specialize in Acrylic, Gel, Pink and White, Fiber Glass And Silk, Fiberglass and Natural Nails. Shellac. My name is Rachel, I specialize in precision hair cutting, Color Specialist, Simply Smooth Keratin Treatment, Up-Dos for all special occasions.